Scottish Labour Conference sends strong message on Scottish Labour’s support for justice at home and abroad. A packed conference hall in Inverness heard powerful speeches from both Labour Leader Ed Miliband and Scottish Labour Leader, Johann Lamont. While they concentrated on Labour’s commitment to deliver on Social Justice at home, Shadow Foreign Secretary, Douglas Alexander stressed Scottish Labour’s proud tradition as an internationalist party fighting for justice at home and abroad. Douglas also launched a short video on the theme of why we are passionately proud of Scottish Labour’s part in the fight for global justice. You can view it here. The video highlights the role Scottish Labour politicians have played in tackling global poverty whether at the International Monetary Fund; on the Board of the World Bank; a Scottish Labour Chancellor playing a lead role at Gleneagles 2005 on Development in Africa and climate change. He also expresses pride in Scotland’s contribution to campaigning organisations like Amnesty, SCIAF, Oxfam and Christian Aid. When we boast that there is nowhere better than Scotland we always remember that there is somewhere bigger. 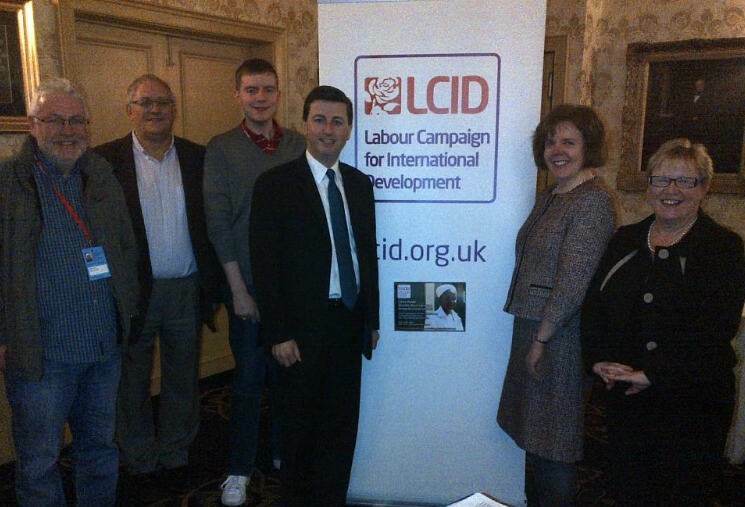 As well as Douglas Alexander’s keynote address, the Conference Fringe had meetings organised by LCID (picture with invited speakers Douglas Alexander and Ann McKechin); Oxfam IF Campaign; Labour Friends of Palestine; and Human Trafficking in Scotland. Exhibition Stalls included Action for Southern Africa Scotland, SCIAF; Oxfam and WWF Scotland.